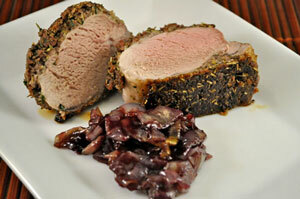 Pork Tenderloin, Red Wine Shallot Confit, Thyme for Cooking easy gourmet. Mix all crumbs, mustard, herbs, garlic and wine in a small bowl to make a thick paste. Spread some of the paste on one side on the pork. Lightly oil a baking sheet and place the pork, herbed side down on it. Spread the paste on the rest of the pork. Drizzle the top with the remaining olive oil. Roast in 400F (200C) oven for 25 - 30 minutes, depending on size, until done. Use a meat thermometer. Remove when internal temperature is 140 F (58C). You can also slice it and take a peak. Slightly pink is okay. Cover loosely with foil and let rest for 10 minutes before slicing. Heat oil in a nonstick skillet over medium-high heat. Add shallots and sauté until tender, about 5 minutes. Reduce heat to low and let cook until browned, about 30 minutes longer. Add brown sugar. Stir well to melt sugar and combine. Add red wine and cook for a few minutes longer. Dissolve cornstarch in water and stir in to thicken. Serve on the side.